I’ve been in OA for over 34 years and have had my share of relapses during that time. I now have 18 years of back-to-back abstinence, and I’d like to share how I am maintaining that. Each relapse reinforced that I had to be willing “to go to any length” to recover. First, I need to say that “God does for me what I cannot do for myself.” This clearly means that I need to maintain contact with my HP through daily “quiet times,” prayers that I can say throughout the day, which come to mind quickly (i.e. the Third Step Prayer and the Seventh Step Prayer) and practicing conscious contact with God. I also silently say to myself different “slogans” that have helped me through the years to get through the “ups and downs”: “This too shall pass”; Live and let live”; First things first”, etc. These help me to regain perspective and provide comfort if I’m troubled or distressed throughout the day. I have worked the Steps through many different processes…and personally, have found that the Big Book Step Study Process has been the most thorough and “life transforming” for me. I was able to thoroughly look at my part in my resentments and specifically do the “turnarounds” that helped me see exactly what had triggered the resentment. The “turnaround” piece of the inventory has provided me with a tool I can use when new potential resentments arise. I also work the program like my life depends on it…because I really feel it does. I have a “cunning, baffling and powerful” disease and left to my own devices, the addiction always wins. When, in the past, I worked the program with “half measures”, I found that I would always eat again. I commit my food daily to my sponsor and also have sponsees who do the same with me. I try to make an effort to call my sponsor if I have a food change. Although I have a flexible food plan (no sugar or alcohol), I also find it very important to commit my specific food plan daily including the amounts, which I weigh and measure when I’m home. I attend meetings…. I try to go to three a week but sometimes only make two. I will supplement with more phone calls if I’m unable to go to three meetings. Phone calls are important because they keep me connected with others who are walking this path and gets me out of myself and my own problems. I also do service in other ways and find this is an essential part of my recovery. As the Big Book states: “Nothing will so much insure immunity from drinking as intensive work with other alcoholics.” I’ve done service on all levels (local, region and world service), and I find that the members of OA who give the most service generally stay in recovery. I try to say “yes” when asked to do anything in OA, if possible. Another important part of my program is to practice gratitude! This, for me, means specifically identifying at least three things a day that I’m grateful for. This really helps me keep a positive perspective and decreases negativity and depression. Member Experience #4: What About the God Thing? I did a lot of research about OA before I walked in the door of my first meeting. The God thing had me worried because I had finally shaken off my religious upbringing. I considered myself a committed atheist. In reality, I was an atheist who should’ve been committed. This Power would do so, if I created a relationship with It. Nothing there about beards, lightning bolts, or afterlives. Nor anything about my character or that I had to fear punishment. Nor anything about any appointed person I had to go through in order to seek this power. In fact, the three points I learned told me that this Power loved me and wanted a direct relationship with me. Perhaps most important: I could believe anything else about a Power greater than myself that I wanted to and that helped me recover. It took me about six or eight months to fully comprehend this idea, but when I did, OA opened up for me in an amazing way. Abstinence wasn’t something I had to fight for, it was something that I asked for, participated in, and gratefully received. It took me another year before I comfortably used the word God, but it’s faster to say than “Higher Power.” It took me a little more time yet to be willing to capitalize the G in God. I do so now because it reminds me that God is a real thing, and because It has helped me, so I owe the respect of an uppercase letter. A small thing? Yeah, but for a former atheist, a huge change. In the end, I suppose that the organized religion of my youth might yet consider me an atheist because I don’t believe in its concept of god anymore. That’s OK with me nowadays; everyone has the right to their own beliefs. And today I believe in a concept that works for me and keeps me out of the food and in OA. The God thing worked out just fine. OA.org recently added a page to its site called To Atheists and Agnostics which is well worth a moment to read. I had been coming to OA meetings for about four months. Although I had not found abstinence yet, I had somehow been controlling the wildest of the bingeing that brought me to OA and had consequently lost about 15 pounds. I spent a great deal of time in those early months unsure whether I belonged in OA or not. You know what they say about denial. In any event, by the grace of God, I kept coming to meetings. Leaving a meeting one evening, I suddenly decided it would be a good idea to hit a drive-thru window, and not just for the scintillating conversation. This would be a transgression of a self-imposed bottom line, but that didn’t seem such a big deal at the time. I ordered and ate with no real satisfaction. As I finished the last of the bag’s greasy contents, I had a moment of truth. And I saw the truth. I had eaten a bag full of empty calories, without my own permission. It was in that moment I decided I want what you OAs have and was willing to go to any lengths to get it. I called a fellow OA member the next day, put together a food plan, and committed to abstinence. I’ve been able, through the tools of the program, the support of fellow OAs, and the grace of God, to maintain my abstinence on a daily basis since then. I can’t say I’m glad I hit that drive-thru, but if that’s what it took to bring me to what I have today, I certainly don’t regret it. And nothing tastes as good as abstinence feels! Share your experience in 2015! You have to give it away if you want to keep it. This year, SeacoastOA wants to hear about your OA experiences! We hope to post OA member experiences as frequently as possible in 2015 to help as many compulsive eaters as we can. You can help by sending us a little nugget of your experience! We’ve made it easy to share. We’re looking for quick, inspirational experiences, not whole stories. These will be completely anonymous, no names attached. This is open to our local members as well as anyone in the OA fellowship who stops by our site and wants to join in. We’re glad to hear from all those joining us on the road to happy destiny! one of your own choosing. 2.) Write 300 to 600 words—One side of a piece of paper or both. Hand delivery—Eric C. or Barbara B. 4.) Relax and take it easy—We’ll proofread it carefully, and we will safeguard your anonymity by withholding your name. If you enjoy it, send us another! There’s no limit on how many of these little nuggets we’ll accept from one individual. If you have any questions at all, drop a line to SeacoastOA@gmail.com. Member experiences are the most popular kinds of content on our website, and we hope that in 2015 we can provide many more of them. Ideally, we would share one a week, but even one fortnightly or monthly will help a lot of people. 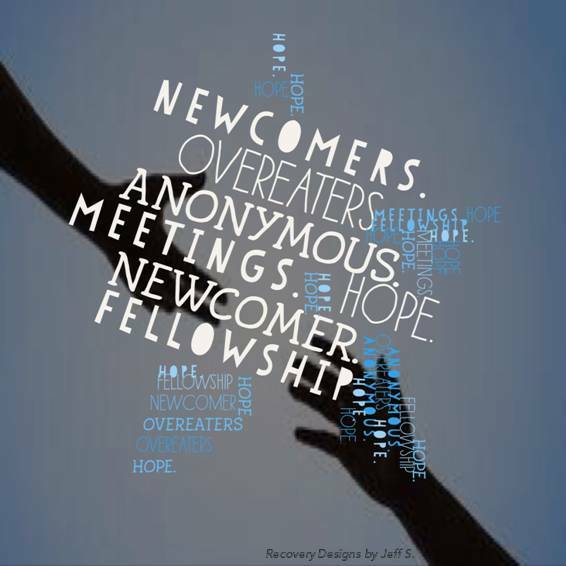 We have to give our recovery away if we want to keep it, and sharing is one of the most basic ways we do service. It helps your recovery, those of our local members, newcomers, and those outside the Seacoast region who visit our site each day (and they do!). Please share what you’ve learned with others. Today we present our first member story, “He Stood at the Turning Point.” We’ll be archiving it in the Our Experiences area of the site so that you can read it at any time. We offer this story and others forthcoming to help newcomers who may not yet be familiar with OA literature, such as The Brown Book, that share members’ stories. We also offer these stories to help current members who may want to read a story from someone closer to home.